A History of the 36th Battalion A.I.F. 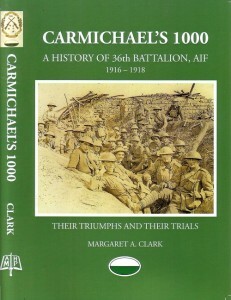 Carmichael’s 1000, a history of the exploits of the 36th Battalion A.I. F. resulted from the discovery that no official history of this battalion had ever been produced. I learnt this whilst researching the story of Alf Haynes which was based on over 200 postcards held at the Wingham Museum. These told the story of his life from leaving Australia to his final card to say that he was coming home. These postcards were the source for the book that I produced for the Manning Valley Historical Society entitled ‘Postcards From the Front – Still going Strong’. 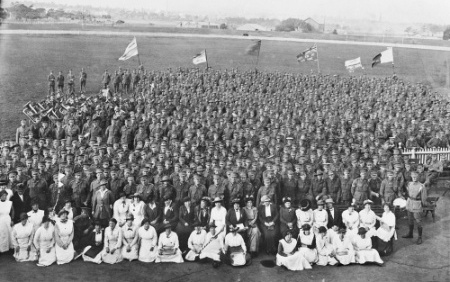 On discovering that no history of this battalion had ever been written I contacted the Army History Unit and was awarded a grant by them to compile a record of the battalion’s exploits. Three years and a considerable amount of research later the book has finally been published by War Books Publishers. The history of the 36th battalion has been told through the medium of the letters, journals and postcards that the men sent home. Many of these were made available to me by the Australian War Museum, the remainder were forwarded to me by descendants of the soldiers in response to advertisements placed in a number of newspapers. The 36th was granted the title ‘Carmichael’s 1000’ as it was largely due to the efforts of Ambrose Carmichael that the battalion was formed. Ambrose Carmichael was a member of parliament in the State Government of NSW when he decided to initiate the formation of a battalion largely from amongst rifle clubs throughout the state. He was successful in his goal and enlisted himself with the battalion, rising to the rank of captain and winning the Military Cross for his bravery and for his ability to inspire the men under his command. Hi, were looking for a photo of charles william ryan 3156,our great uncle,he was in carmichaels 1000 ,also he was in 33rd battalion, any info would be appreciated, regards mike ryan. The book is about the 36th Infantry Battalion in The Great War (1914-1918). Your uncle N443962 Private William Royston died of wounds on Christmas Day, 25th December 1942 in Papua during the Second World War of 1939-1942. The oak leaf you refer to signifies he was “mentioned in despatches,” notification of which was published in the London Gazette of 23 December 1943 on page 5577 at position 137 and the Commonwealth Gazette of 23 December 1943 on page 2798 at position 87.